Honeyed Walnuts – the easiest sweet-treat ever! Well, I use honey for baking, for raw deserts and for medicinal purposes. But the current, most popular use of our new “rough/raw” honey is Honeyed Walnuts. Those big white buckets are brimming with Raw Honey and the bag next to it is packed with bee pollen. I’m a total Raw Honey and Bee product fan. In addition to being luscious and sweet, honey is a Superfood. Eating a teaspoon of local raw honey is said to lessen your reaction to local allergens. As with any other sweetener, it’s important to use honey in moderation. It’s high on the glycemic index, which means it raises your blood sugar quickly. Because I use honey both medicinally and as a sweetener when baking I am always on the lookout for great honey. As you might imagine, I was excited to find Mike Graney, who is a beekeeper in the Boston area. Actually, I found Mike’s honey first through my beloved BostonOrganics.com (organic produce delivered to my home – who can ask for more?). But I was curious if Mike’s honey – technically Mike’s bees honey – was really raw. 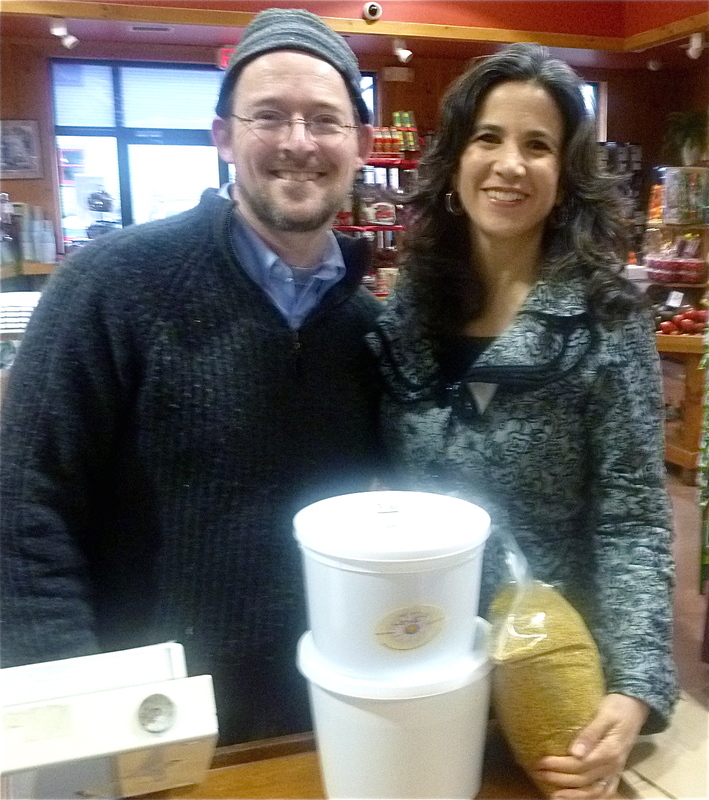 So I called him, we met, chatted, and I came home with 5 lbs of his Pourable Honey for baking, 5 lbs of his Rough Honey (which I had never heard of) for non-heated use and 5 lbs of Bee Pollen. That’s a lot of bee work! Nina: Is your honey raw? Mike: My pourable honey is not heated above 115 degrees… [Nina: for raw foodists that is considered raw] …but, I believe, like many honey purists, that truly raw honey is still in the comb. If its been taken out of nature’s package, it’s no longer raw (I don’t care what temperature it was held at or how little it was strained). Extracting by any means constitutes processing. 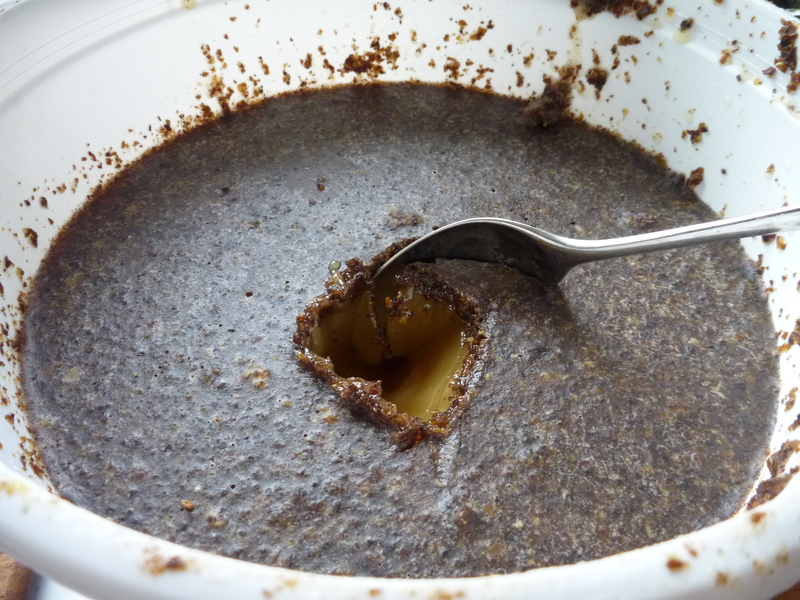 Rough Honey - the top layer is the bee pollen, propolis, wax and other healthy hive bits. Me: Tell me about your non-pourable honey, that you call Rough Honey? Mike: Out of demand for RAW honey, honey that was LESS processed – unheated and unstrained (I don’t make enough comb honey to sell) – I came up with the Rough Honey to offer to people who like the idea of a less refined product with bits of crushed wax in a creamier honey that is mostly crystalized. It essentially comes out of the extractor and into a jar. It is NOT VERY GOOD for cooking, tea, or recipes, due to the trace wax, which leaves a film on a hot cup of tea. That said, I have enjoyed many, many cups of tea with that film on top. It doesnt spoil the tea, it just looks different from the usual. Nina: How else do you use Rough Honey? Nina: What are the health benefits to Rough Honey? Mike: Honey has been associated with health food for a long time, but I make no claims to honey’s health benefits…I just listen to the people who say it has great effects on them. An old story from Britain is that in the days when tenant farmers would pay rent to the landowners in say, hogs, sacks of oats, or honey depending on the situation, the nobility would claim the clear, clean honey for their payment, leaving the farmers to eat the broken wax still sweet from the honey bound in it. Legend has it that when the peasantry began out-living the nobility, their “rough” honey was suspected to help them live long healthy lives. If you are looking for EatLocalHoney honey, you can find it through BostonOrganics.com or Pemberton Farms or contact Mike at EatLocalHoney.com. If you’re not from the Boston area, find your local bee keeper, it’s worth it! Here’s one of my favorite ways to use Raw Honey: Honeyed Walnuts.